Came across an interesting video lecture on Snipersh_de presenting that a level scope on a slightly canted rifle had negligible effects at 1,000 yards. As long as the scope reticle is plumb to gravity, your dope for elevation and wind will stay true. I think there should be zero effect, other than the tiny displacement of the barrel compared to where it would be if the gun were level. Am I missing something? 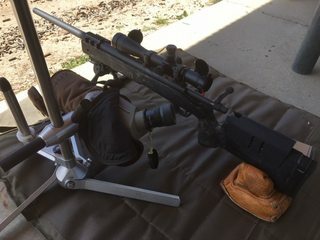 It seems there's always discussion (in the optics section) about the scope must be mounted perfectly level on the rifle. Which leads to further discussion on methods to ensure it is "level". I was interested that he actually tested and proved that a level scope was what mattered, dispelling many myths. Last edited by smoothy8500; 04-13-2019 at 7:24 AM..
You could mount a scope on a rifle at 90 degrees and shoot gangster style. As long as the scope is level and zeroed that way. Might be hard to shoot thought. The barrel does not know which way is up. Last edited by Hoffer; 04-13-2019 at 8:55 PM.. I don't get it. Why wouldn't he just use a canted buttplate instead of canting the whole rifle? It's interesting that 3 or 4-way buttplates are most common on Palma or sling rifles which have a more pronounced cant when shouldered. I've seen a few F-class rifles with fully adjustable buttplates, but outside of that you never see them. My current F-T/R rifle has a natural inboard cant that I have leveled the scope to accommodate. What's interesting is watching other shooters with bubble levels at these matches. They generally don't check their level and most have some cant induced in their rifle but are unaware. Last edited by smoothy8500; 04-14-2019 at 8:44 AM.. The levels are probably more useful in PRS type stuff, where they might be just throwing their rifle on a prop or tank trap. The rifle is a lot more likely to be crooked compared to resting it on the ground. Or maybe everyone has a SIG Tango 6 scope with an electronic level inside the scope. All times are GMT -8. The time now is 2:28 AM.